Regarding Mr. Hipple’s article “African Navies Week: Al Shabaab is Only the Beginning”, he addressed a critical issue which all too often does not receive proper attention. It is a daunting prospect to try and pull in the disparate threats from across the continent formulating a single threat analysis and, while his conclusion is accurate in that he points out the diverse threats facing the continent, from a purely security-focused perspective, it still lacks some necessary clarity. The problem is the moment you start looking at how individual factors within a given country are driving conflict/instability, you quickly lose the scent of how it ties into the transnational threat groups. There is also the problem of how far back you are willing to look, the specter of Colonialism is still present and the post-colonial relationships cannot be entirely discounted. There are too many fundamentally different factors at play across Africa to compare the potential for total, though not collective chaos that threatens the continent and still have the comparison to Afghanistan be a strong one. While Afghanistan is easily evoked as a common point of reference and there are elements of similarity that narrowly can be compared, each region of the continent has enough of its own issues to cause the wheels to come off of the Afghan comparison. Additionally, once you make the comparison to Afghanistan it easily leads to a false equivalency. The threat from Boko Haram (BH) is real and growing yet the Nigerian Government is wholly unprepared to handle it – their heavy-handed tactics have increased distrust in the government and have not deterred or degraded BH. 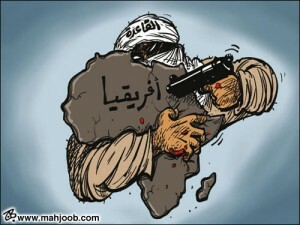 More importantly, the growing alignment between Al Qaeda in the Islamic Maghreb (AQIM) and BH marks a significant development in the connectivity of pan-African terrorism. However, these groups do not monopolize the West African threat. The spread of BH into Cameroon is tied to their evasion the Nigerian military’s offensive operations. What is happening in Niger with regards to BH is mostly proximate. The more apt comparison for the growing instability in Niger is the likeness to Mali where you see disenfranchised Tuaregs of the north returning from service in Libya (Gaddafi’s desert battalions) flush with weapons, training and a desire to have a say in their government. In both Mali and Niger, the Tuaregs have been persecuted and altogether cut out of the political process by the ethnically separate majority in the southern capitals. Disenchantment with the government in Bamako and simmering ethnic discord set the stage for French operations in January, however, what caught world attention was the marriage of convenience by the MUJWA and elements of AQIM. Given the disassociated natures of the AQ franchise, it can be difficult to make sweeping generalities because the various strains (AQIM, AQEA, AQAP, AQI and AQSL) each have their own local idiosyncrasies, but one thing they do have in common is their ability to first bond with a local cause/faction on ideologically tenuous grounds and then quickly alienate themselves from the population with their unique extremist ideology which is often incompatible with local norms – see AQI and the Sunnis, AQAP and the Tribes of south central Yemen or AQIM and the Tuaregs. My point is, while virulent strains of AQ exist across the corners of the continent and in their own right pose a threat, they have had difficulty building and maintaining strong and enduring relationships with other local movements. The AQ-BH connection is growing, and AQEA/AS in the past two years “formalized” their relationship, however, when you look at the nature of the threat on the ground in Somalia for example, there is a definite rift. Continuing in the East, while the threat from AS/AQEA has expanded beyond Somalia, it is worth noting that the focus of their ire has not been indiscriminate but has targeted those countries participating in AMISOM. With regards to CAR, while Seleka partnership with anyone would only further degrade a poor situation, the nature of the Seleka rebels themselves does not lend itself to partnership with any of the aforementioned groups. It is also worth noting that within days of capturing the capital, the rebel groups splintered and immediately fell into the same trap as their government predecessors – an inability to exert influence beyond the capital. What this means in the long term is that the security vacuum is being filled by the rebels with no real solution. Moving North, there is a fascinating and frightening mélange of issues at play in the Maghreb and the single commonality is that each of the governments in their various degrees of weakness is attempting to quell internal dissent. Libya is the new frontier since the fall of Gaddafi, and the government has no ability to project power, they cannot control the capital let alone anywhere else are forced to in equal measure threaten and placate the militias within Tripoli. However, the ungoverned spaces elsewhere have been, at least temporarily ceded, as the government attempts to consolidate power. Tunisia is still dealing with the fall out of the Arab spring and has been unable to form a coalition government that meets the needs of both Islamic factions and strong secular sentiments/groups. While the graphic paints a fairly grim picture of the continent, the reality is even grimmer yet as it fails to capture one of the longest ongoing conflict in the Kivu region of Eastern DRC. Furthermore, with regards to the maritime threat, there are fundamentally different factors at play on the East and West Coast; while piracy is the end result, the elements driving them are quite different. In HOA you have piracy being driven by the fact that Somalia is a failed state and pirates take advantage of their proximity of shipping lanes in the Bab-el-Mandeb. Along the West coast, the piracy issue is being driven by the desire to exploit components associated with the off-short oil wealth of Nigeria. The biggest problem as it applies to maritime security is that too many governments across Africa still perceive maritime security to be a luxury they cannot afford. It is easy to discuss how it Maritime security has a chance to minimize the flow of extremists and the vast potential to make a positive impact, but like so many things, without sufficient local buy-in, the effort is dead on arrival. It is difficult to address broad security threats across Africa without becoming hopelessly mired in the details; this is why all too often security threats on the continent are looked at in isolation without broader thought given to overarching threats. This is further complicated by the fact that the commonality of the threats spanning the breadth of the continent, their origins and likely the solutions, exist beyond the security realm. Uneven and underdevelopment, disenfranchised populations, and natural resource exploitation along often colonial lines drive what has to date been considered an acceptable level of instability. The various extremist movements are indicative of systemic and structural failures. Mr. Hipple’s article was a valiant effort at addressing one of these issues, but it is exceptionally difficult to frame the problem appropriately so as to address the relevant factors at appropriate depth while not missing necessary nuance and simultaneously addressing significant transnational factors. Until the broader issues driving current conflict and instability are addressed, we are likely to see more of the same. Timothy Baker is Marine Officer in the United States Marine Corps Reserve and a Masters Candidate at Columbia University. The opinions and views expressed in this post are his alone and are presented in his personal capacity. They do not necessarily represent the views of Columbia University, U.S. Department of Defense or the United States Marine Corps.